On Friday 17 April 2015, the Guildhall School's Milton Court concert hall will see the London premieres of no less than four of Howard Blake's works. The German cellist Benedict Kloeckner is joined by violinist Madeleine Mitchell, viola player Rivka Golani and pianist Sasha Grynyuk to perform Blake's Diversions for Cello and Piano, Piano Trio no, 3 'Elegia stravagante', Piano quartet, Prelude for solo viola and The Enchantment of Venus for cello and piano. 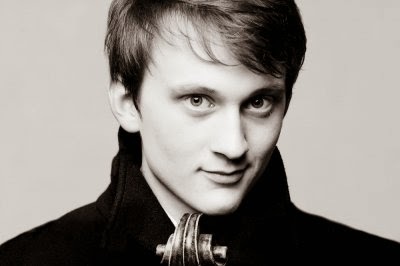 Benedict Kloeckner (born 1989) won the European Broadcasting Union's Young Artists Competition in Bratislava in 2010, playing Blake's Diversions and subsequently Blake has arranged a number of works for Kloeckner including the two of them have performed Blake's work together a number of times and recorded the music for cello and piano on the Genuin label. I first heard Blake and Kloeckner playing together in 2013 (see my article) at a concert to celebrate Blake's 75th birthday. Further information about the concert and tickets from the Barbican Centre website.